Bellow you will find the list of features included as standard with every license of WS.WebTV Free. 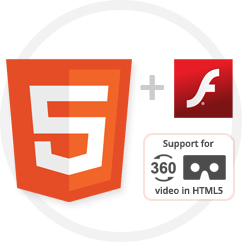 Our solution works seamless with HTML5 + Flash, for maximum compatibility with different playback devices (PCs, Mobiles, Tablets, etc.). You can select which technology do you prefer as default and which one as fallback and the WebTV will use the most appropriate one according to the capability of the users devices. • Seamless HTML5 + Flash playback (MP4 H.264 + AAC and WebM sopported). • High Definition (HD) video playback. • 360° + VR video playback10. • Video thumbnails (preview/tooltip thumbnails). • Support for time-synced playlists (fake lives). • Multiple video qualities (with automatic bandwidth detection4). • Aspect ratio correction (4:3, 16:9, 9:16 -portrait/vertical-, anamorphic, etc.). » Important information regarding HTML5: Compatibility, iPhone/iPod limitations, etc. » Information regarding supported video formats, playback technologies and protocols. » Information regarding 360° + VR video playback support. » Information regarding 3D video playback support. Video channels are playlists where the included videos are played back in sequence. 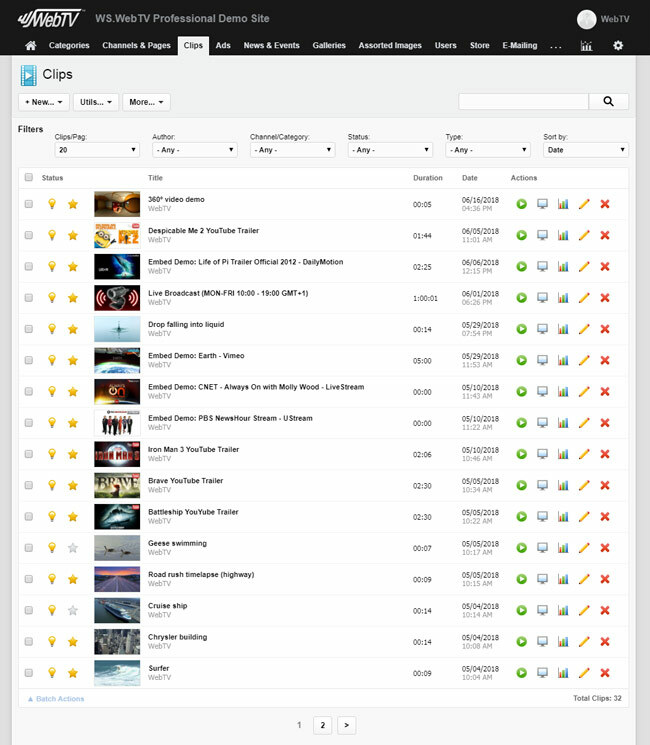 You can create any number of video channels and sort out the playlists, the way you want, using drag and drop. Playlists synced with time allows you to simulate a TV Channel broadcast (fake live). The player will start playing back the corresponding video according to the start time as well as the current time. Please note that this functionality is much more limited respect the included in WS.WebTV Pro. 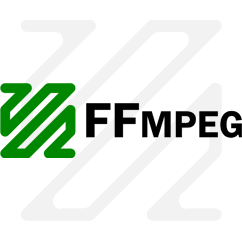 If your server/hosting supports FFmpeg* 1.2, or higher, WS.WebTV allows you to transcode videos automatically: From a single video source file the system will automatically generate the corresponding poster/thumbnail, video thumbnails (sprite), and will encode the different WebTV video qualities. All is managed from an encoding task manager where only one task is processed at a time (one after another). It is worth mentioning that the FFmpeg commands use "nice" to slightly reduce the load on the server's CPU; additionally, the commands can be edited in case you want to add parameters that -for example- reduce the number of "threads" used during the encoding, etc. What if my server does not have FFmpeg or if I don't want to use it? In this case you can use the "standard" Clip type which allows you to upload video files which are already Web encoded/optimized. *Check the requirements section for FFmpeg specific requieremts. Note that WS.WebTV Free only allows you to create one image Gallery in your WebTV. 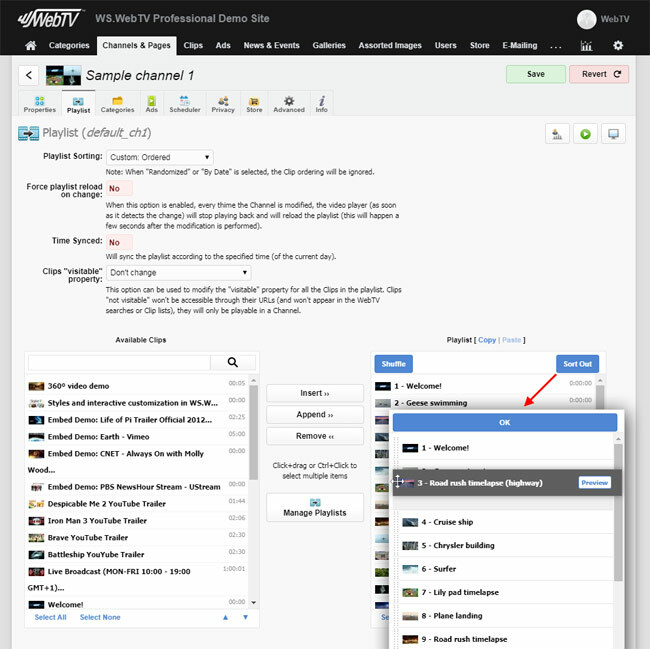 WS.WebTV Pro is required to remove the Gallery creation limitation. If you don't already have a Website, then you can build it with WS.WebTV!. 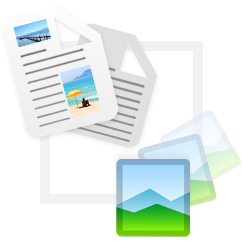 Organize your videos, channels, pages, galleries, news8 and events8 with categories and subcategories. You can create any number of categories, additionally, each category can have up to three subcategory levels. For each category, you can provide a poster image as well as a detailed description with HTML content, using the integrated WYSIWYG editor. Additionally, categories can include a slider with the latest content added to it. Design the main and footer menus the way you want: including buttons for video channels, pages, categories and links. Menus can have submenus (up to 4 nesting levels). Additionally, the menu items can be sorted out, easily, using drag and drop. You can create "Portal" pages which include an image slider and an overview with the latest items of the WebTV (videos, channels, galleries, news8 and events8). This kind of page if ideal to be used as Home Page. You have several options to set the Home Page of your WebTV: You can select a specific Channel/Page, Latest Videos or Latest News8 as the Home Page of your WebTV. Social features: Sharing, Comments Features. RSS Syndication. Easy chat widget integration. • Include links to your social network profiles in the WebTV. 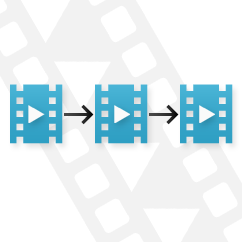 • Auto generation of Link and Embed codes for every video. • Buttons for sharing videos on several social networks. • "Like" and "Dislike" rating buttons for every video. RSS Feeds for the WebTV, video channels, categories, etc. • Facebook Comments system integration. When this feature is enabled, your visitors will be able to comment on Channels, Videos, Galleries, etc. using the Facebook Comments plugin. You will be able to associate your Facebook user ID or App ID in order to moderate the published comments. 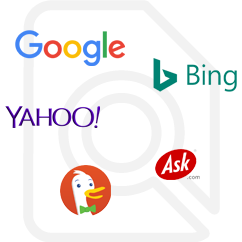 • Disqus Comments system integration. When this feature is enabled, you will be able to associate your Site "shortname" (Disqus unique URL) to allow your visitors comment on Channels, Videos, Galleries, etc. using this system. Do you want to include a chat into your WebTV? No problem. It is very easy to integrate solutions like LiveChat (tutorial here), Samrtsupp, Chatango, Chatwee, RumbleTalk, etc..
WS.WebTV Free comes with two visual styles. WS.WebTV also includes several widget types that allow to insert arbitrary HTML code, video/channel/category lists, tag cloud, etc. 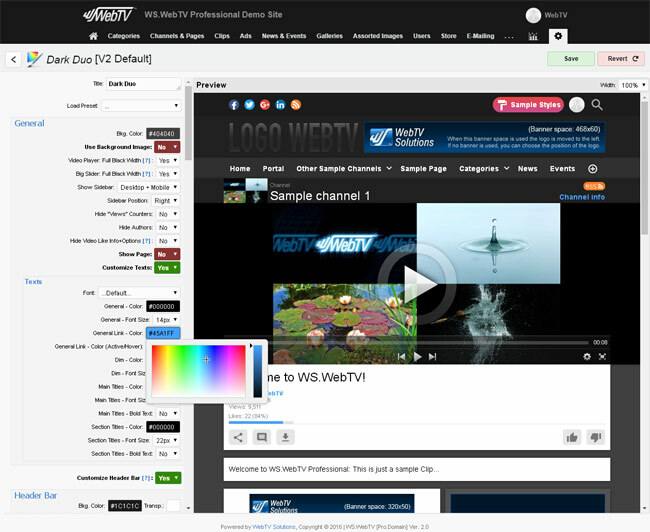 By default, the WebTV has a widget zone located in the sidebar; however, additional zones can be added by editing the templates and theme file. But that's not all; our solution has been developed with Web designers in mind, so if you have HTML and CSS knowledge you can create your own themes, template variations and styles. 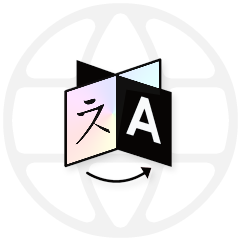 The Interface is available in several languages*; however, you can easily create and edit language packs. Additionally, WS.WebTV's Front-End supports RTL languages. *Translation credits at the end of this page. **Available from third party (at extra cost). Contact us for more info. WS.WebTV has been designed for easy search engine indexing. You can provide descriptions and tags for every video, channel and page. It also includes a standard and a video-specific sitemap generators. Our solution can also generate the Strutured Data ("Organization", "Video", etc.) required for the Google's "Rich Snippets". The application has a basic User management system that allows creating multiple Webmaster and Administrator accounts. Recently, we have integrated tools to help you comply with the GDPR (General Data Protection Regulation), applicable from May 25, 2018. 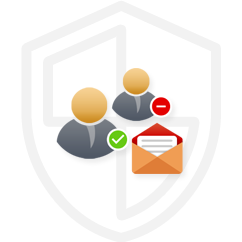 Additionally, in the case of having the Advanced User Management extension, you can also configure the WebTV to encrypt the personal User information (like E-Mail, name, etc.). NOTE: Data encryption requires PHP 5.4 + PHP OpenSSL. The passwords for the user accounts are securely stored as "hashes". A "hash" is a representation of a text which is not reversible; this means that it is not possible to recover the original password (in plain text) from a hash; therefore, it is a very safe way of storing such sensitive information. WS.WebTV Free can be upgraded to WS.WebTV Professionl, anytime. • Easy to use and modern interface. 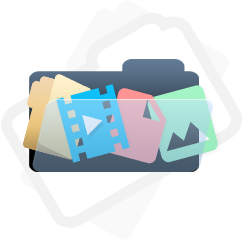 • Create, edit, batch-edit, activate, deactivate and delete Clips. • Create, edit, activate, deactivate, group, delete Channels and Pages. • Channel playlist editing and programming (setting starting point based on time and day of the week). • Create, edit, activate, deactivate, delete Users. • Extensive WebTV configuration section. 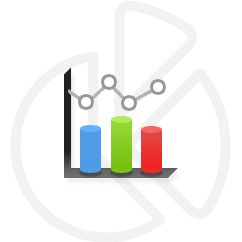 • Statistics section: With statistical information regarding Clips, Channels, Searches and more. • Session concurrency check: Two users can not use the same credentials to log in, at the same time. 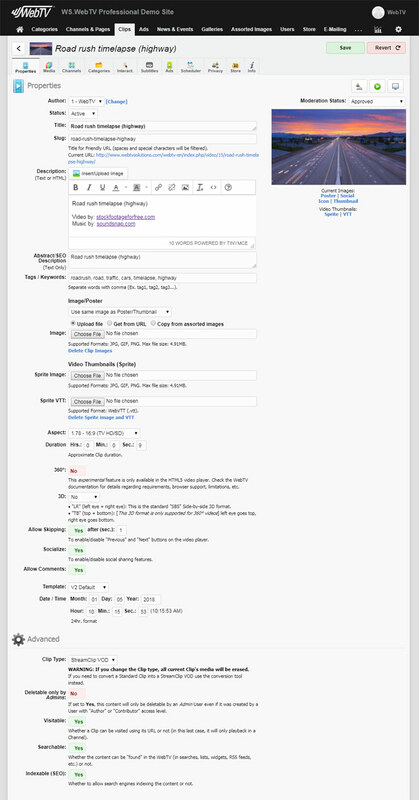 • Caching system for pages, sitemaps, feeds and playlists.  • Diagnostic tool for getting information about the Server (PHP) settings. • Installer Script for quick and easy installation. The features detailed in this page always correspond to the latest released version of WS.WebTV; therefore, some of them may not be available in older versions. 1 Optional extension is required for a mobile-device-optimized interface. WS.WebTV has not been tested on BlackBerry or Windows Phone devices. 2 Optional StreamClip extension is required for Live or VOD Streaming. Check StreamClip extension description for more info. 3 FLV can only be used on the Flash video player. WebM can be used in addition to H.264. 5 Stereoscopic video files playback recorded in the popular side-by-side format. Various 3D visualization modes: anaglyph (red/cyan and green/magenta glasses). 3D video support has only be tested on with conventional progressive/on demand download (HTTP). Glasses not included. 8 Optional News and Events extension is required. • Screen captures correspond to the WS.WebTV Professional Content Administration Interface which is very similar to the Free one. Some features will not be available on the Free version. • Some features/tabs/buttons displayed on the screen captures might correspond to optional extensions (not included on the free version).